This edition gives readers an approach that combines fundamental geographical elements, internal regional diversity, and contemporary issues. Each regional chapter is organized by sections which summarizes the distinctive physical and human geographies of the region; explores the internal diversity of the region at sub regional, selected country, and local levels; focuses on a selection of contemporary issues that have implications for the rest of the world. New information: The world in which we live is constantly changing. This edition features new information on population changes, migration, the global economy, gender (in)equality, conflict, and the environment. Globalization is causing some societies to become increasingly connected as they share products, styles, and ideas. At the same time, others remain disconnected, and often by choice. In either case, the world’s connections are continually changing. New and improved physical features maps. Each new chapter opener is now a redrawn and enlarged full-page physical features map, or a two-page map in the case of Chapter 3: Russia and Neighboring Countries and Chapter 7: Northern Africa and South-western Asia. The new maps show major physical features, country boundaries, capital cities, and other major cities that students can easily reference while reading the chapter. Learning objectives have been added to each chapter to help guide both the instructor and students through the key content of the chapter. Natural disasters and human-environment issues. Unfolding crises are seamlessly integrated into the regional discussions of the human dimension of physical geography and environmental issues. Disaster coverage is also integrated into relevant political and economic discussion. The scale of impacts from local to global is analyzed to help students to appreciate how events in one part of the world can affect everyday life in others. LearnSmart - Built around metacognition learning theory, LearnSmart provides your students with a GPS (Guided Path to Success) for your World regional Geography course. LearnSmart intelligently assesses a student’s knowledge of course content through a series of adaptive questions. It pinpoints concepts the student does not understand and maps out a personalized study plan for success. McGraw-Hill’s Connect Plus (www.mcgrawhillconnect.com/Geography) is a web-based assignment and assessment platform that gives students the means to better connect with their coursework, with their instructors, and with the important concepts that they will need to know for success now and in the future. 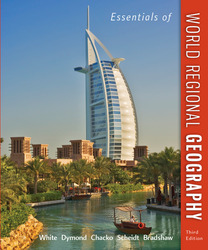 The Essentials was produced with the same high quality artwork, illustrations, and photos found in the Contemporary World Regional Geography, but contains 200 less pages. Bradshaw taught geography at the College of St. Mark & John (Plymouth, England) for 22 years. His research has focused on the impact of US federal programs in Appalachia.